This post is action packed. Seriously. First up, it's time for Pumpkin Mania. I'm teaming up with a fabulous group of bloggers for a pumpkin themed party. We'll each be sharing a pumpkin project next week. I'd better get to crafting! 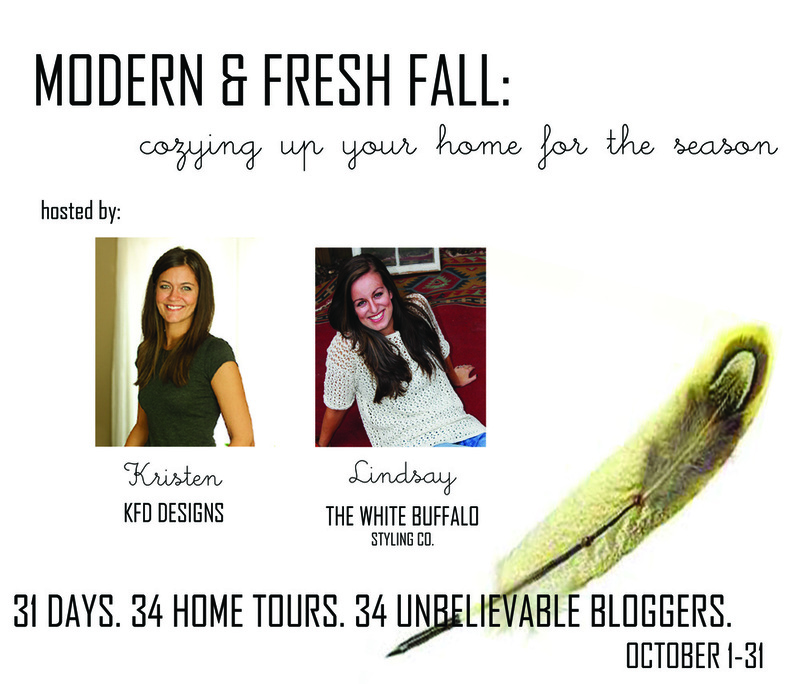 Next, I've been invited to join another group of ladies for a blogger home tour series, based on a "fresh and modern spin"on Fall. We were asked to think of fresh ideas - not your basic Fall decor. Being part of this tour is exciting and terrifying at the same time beings I have approximately two Fall items in my house right now. I have some fun work ahead of me! Be sure to check out the tours from the hosts today! 1 – Kristen and Lindsay. 2 – Sarah from Sarah M. Dorsey Designs 3 – Gabbi from Retro Ranch Reno 4 – Brittany from Brittany Makes 5 – Jesse from Scout & Nimble 6 – Julia from Cuckoo 4 Design 7 – Carolyn from Sweet Chaos Home 8 – Jennifer from The Chronicles of Home 9 – Bethany from Dwellings by Devore 10 – Carmel from Our Fifth House 11 – Kristin from The Hunted Interior 12 – Annekke from This That & Life 13 – Michelle from Decor and the Dog 14 – Cassie from Primitive & Proper 15 – Ally from From the Right Bank 16 – Shannon from Shannon Berrey Designs 17 – Danika from Gorgeous Shiny Things 18 – Kristin from Bliss at Home 19 – Jenna from Rain on a Tin Roof 20 – Jessica from Dear Emmeline 21 – Kelly from View Along the Way 22 – Sarah from Lacquer and Linen 23 – Eileen from A Creative Day Blog 24 – Sarah from Royal Marigold 25 – Lori from Lori May Interiors 26 – Jennifer from Dimples and Tangles 27 – Caitlin from Desert Domicile 28 – Sherry from Design Indulgence 29 – Lakeitha from Lakeitha Duncan Lifestyle Blog 30 – Shavonda from A Home Full of Color and Whitney from The Curtis Casa. 31 – Angela from Number Fifty-three and Jennifer from Brave New Home.